These are questions we all ask ourselves, but it's hard to get past conjecture or gut feeling to find any definitive answers. 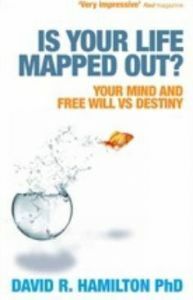 Now, in this ground-breaking book, David Hamilton looks at hard scientific evidence to bring us closer to understanding the balance between the forces of destiny and the power of free will. Exploring new, cutting-edge scientific research into the nature of time, and drawing on fields such as quantum physics, epigenetics, solar cycles and even reports of near-death experiences, David explores how, rather than being a question of one versus the other, destiny and free will can in fact work simultaneously in his fascinating new theory, 'The Tree of Probable Life'. He shows how, ultimately, we create many of the conditions of our own lives and offers some powerful, practical principles that can bring amazing results.